Monroe is a city of 17,500 people in the Puget Sound region of western Washington. It is located in Snohomish County, about 30 miles northeast of Seattle and 20 miles southeast of Everett and Marysville, on the Skykomish River. 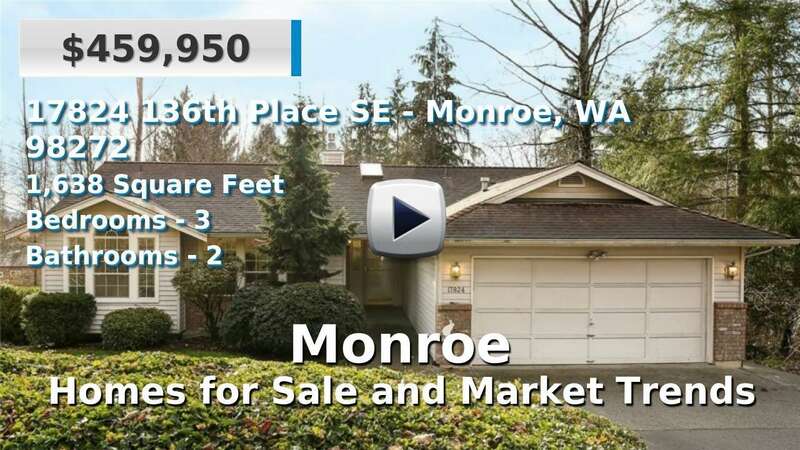 Attractions in Monroe include the Evergreen Speedway and Evergreen State Fairgrounds, popular entertainment destinations in the area, as well as the Skykomish River and nearby lakes, parks, and trails. Many residents choose Monroe for its rural atmosphere, though the city is growing constantly and offers plenty of newer homes for sale, as well. 3 Beds | 2 Baths | 1102 sq. Ft.
4 Beds | 2.5 Baths | 1760 sq. Ft.
3 Beds | 2.5 Baths | 2562 sq. Ft.
4 Beds | 2.25 Baths | 1788 sq. Ft.
5 Beds | 2.75 Baths | 3440 sq. Ft.
4 Beds | 3 Baths | 2580 sq. Ft.
3 Beds | 1 Baths | 1357 sq. Ft.
4 Beds | 2.5 Baths | 2791 sq. Ft.
4 Beds | 2.75 Baths | 3044 sq. Ft.
4 Beds | 2.75 Baths | 3102 sq. Ft.
5 Beds | 2.75 Baths | 3082 sq. Ft.
4 Beds | 3 Baths | 2810 sq. Ft.